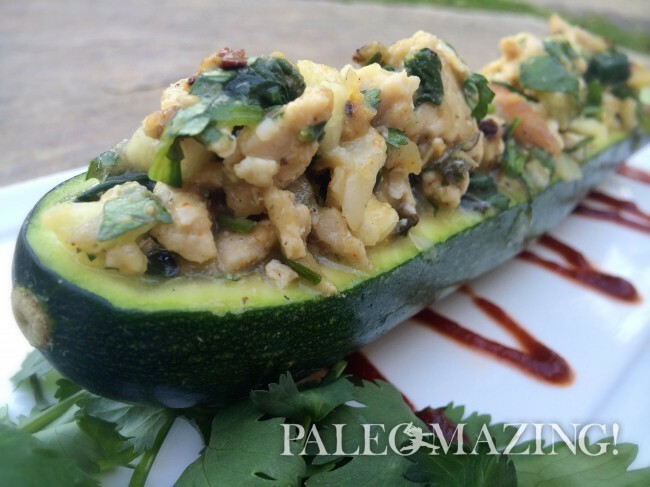 I got the inspiration for these paleo Mexican stuffed zucchini boats from a variety of sources and suggestions from others. With Cinco de Mayo upon us I felt it was about time I created a clean and healthy dish with the spices we’re accustomed to in some Mexican dishes. I for one like a bit of spice and yet my husband prefers a lighter bite. Lucky for me the kids like spicy like me! Try these with my Paleo Non-Fried Fried Ice Cream for a complete Mexican meal. This recipe is really easy and be sure to make extra if you like leftovers. This one is TERRIFIC as a next day or even later snack or meal, warmed up or cold. On that note, another great “leftovers” meal is my Paleo Crustless Quiche. Great for breakfast, lunch or dinner! I always make any recipe with the option to alter the heat range so it can be suitable in any home, even no spice if that is what you prefer or if you have young kids in the home. Some with IBS, Crohn’s or a healing gut cannot and should not attempt too much in the form of spicy foods. Enjoy and Happy Cinco de Mayo for all of you celebrating this special day! A delicious and clean twist of healthy American meets healthy Mexican. Spices are always adjustable. Cut each zucchini lengthwise down the middle, to make 2 halves from each. Take an apple corer and remove the inside, but be careful not to cut into the dark green. Leave about ⅛ inch on the sides and bottom. This will be your “boat”. 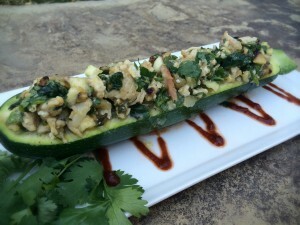 Take the zucchini pulp and chop up semi fine. Heat 1 tablespoon of oil on medium until hot. Add the onion and cook until semi-glossy then add the zucchini pulp and saute for 1 minute. You may add some tabasco at this point if you like spicy or hot. Transfer to a deep bowl. Add 1 tablespoon of oil to the same pan and heat oil on medium. Add ground meat and cook until done. Add to bowl with onions and zucchini. Drain all but 1 tablespoon of the juices and oils and sauté Canadian bacon in same pan until slightly browned. Remove bacon to cutting board - slice into small slices. Add Salsa Verde, cilantro, chili powder, tabasco and salt and pepper to taste. You may add shredded cheese at this point if you desire. Stuff the boats with the mixture and pile them nice and high, then stack them close to one another in a baking dish so they stand upright. Remove and let sit still while covered for 5 minutes. If you have extra meat mixture, you may heat the leftover meat as well in the oven. You may serve a little extra protein on the side of each boat with a garnish of cilantro and a touch of hot sauce. Made this today and it was delicious yum. Made more of it so I now can pop one out of the fridge for lunch.